This statue is next to the Jagiellonian University in Kraków. It was designed by Cyprian Godebski in 1899 as a top of a well and originally stood in the courtyard of the Jagiellonian’s Collegium Maius (Copernicus studied at the Collegium Maius in the years 1491 – 1495). It was moved here in 1953. This sundial is on the south wall of St. Mary’s Basilica of Krakow (also known as Church of Our Lady Assumed into Heaven). This 14th-century church is famous because on every hour the Hejnal mariacki is played from the top of its highest tower. The song breaks doesn’t finish to commemorate the death of trumpeter who was shot in the throat while sounding the alarm before the Mongol attack on the city. It was Bolesław V, “the Chaste One”, (1226–1279), Duke of Sandomierz in Lesser Poland from 1232 and High Duke of Poland from 1243 until his death, who introduced in 1257 the city rights modelled on the Magdeburg law allowing for tax benefits and new trade privileges for the citizens and this plaque was designed to conmemmorate the 750th anniversary of this moment. 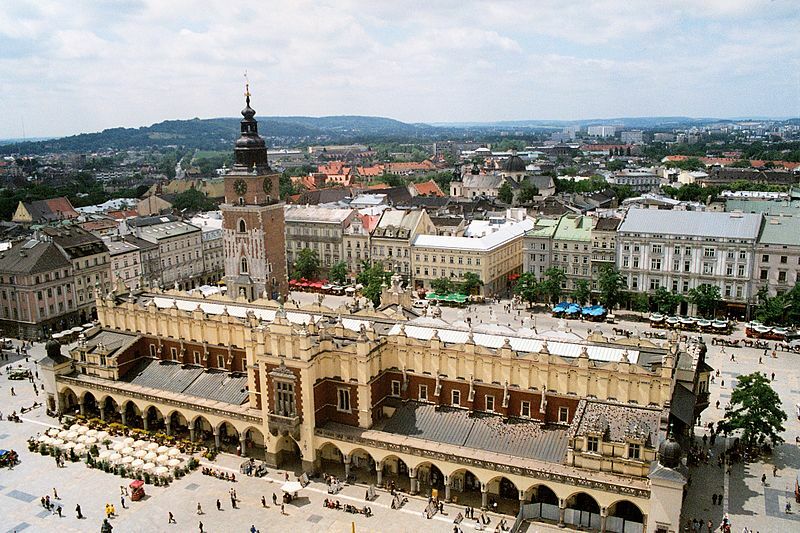 It’s in the middle of the main square of Krakow and everybody visit it and buy something in the shops of the ground floor. Finally will be the last? Here was the oldest pharmacy in Torun, established in the 14th century by Arnold, an apothecary from Wroclaw. In 1652 the pharmacy was granted the name “The Royal Pharmacy”. A figure of an eagle was placed over the door in the 18th century. From then on it has been called “The Pharmacy under the Eagle”. It was a nice present before leaving Torun! There is another monument of Copernicus in Torun designed by Wiktor Brodzki (1817-1904) in 1871. It is inside the Old Town Hall and you can see it in the main entrance of the museum housed there. So, enjoy it! One more monument for the collection! These two sundials are on the main door of the Sanctuary of Black Madonna in Jasna Góra in Czestochowa. This fountain representing the Solar System was totally renovated and redesigned as a part of the Old Town of Torun renovation in 2008. It gushes water out of 115 nozzles in the perimeters of the orbits of the planets up to the height of 5 meters. Only five seconds to remember this other monument dedicated to Nicolaus Copernicus and his heliocentric system in Torun!